No. 3 Florida Gators baseball (42-15) has been announced by the NCAA as the host of one of 16 regionals for the 2010 NCAA Tournament. 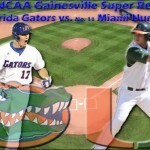 Four teams, including the Gators, will compete in the Gainesville Regional at McKethan Stadium beginning on June 4. On Monday, the NCAA set the entire 64-team field, placing Florida Atlantic (35-22), Oregon State (31-22) and Bethune-Cookman (35-20) in the Gainesville Regional. Florida will take on the Wildcats in the second game of the event on Friday, June 4 at 7 p.m. The first game will feature the Owls and Beavers going head-to-head at 1 p.m. The winner of the Gainesville Regional will face the victor from the Coral Gables Regional (featuring host Miami) in Super Regional action starting Friday, June 11. Should Florida win, Gainesville, FL, would likely be the host site of the next round. 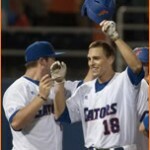 Gators senior outfielder Matt den Dekker was named to the 2010 Southeastern Conference All-Tournament Team on Sunday. den Dekker was only 4-15 (.267) during the event but led Florida with four RBI and tied for the lead with three runs scored. Tournament-winner LSU (five), Alabama (three), Ole Miss (one) and Vanderbilt (one) filled out the rest of the 2010 team.